this bag is so amazing! i love it! white is the new black. ahhh all celine items are amazing aren't they? E' vero : e' bellissima!! Hey! Don't stop talking about Celine Valeria!!! I love their bags too, just wish I could afford them all!!! bellissima....perfetta per l'estate in arrivo!!!!! 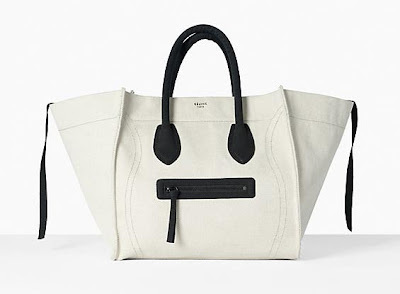 I can't get over the fact that the bag looks like it has a face. Yes, that is adorable! Just buy it LOL! Beautiful bag - love the structure and the color contrast! i WANT ! its on my wish list!!! That is a gorgeous Celine bag! Love them too and I'm now following on GFC and Bloglovin! This is definitely a gorgeous bag! So stylish! I wish to have the same one for summer!!! What a gorgeous bag! Are you getting it or you already own it? Ciao Valeria! Meno male la pensi come me su MJ. Ilm mondo mi sembra impazzito, ha sfilato una copia palese e tutti a lodarlo! Mha!!! Ahahahah Ale magaaaaari!!!! No no sto risparmiando x la strage che faro' x Marni@h&m...un bacio! Jajajaja esa cartera pareciera que tiene una carita sonriente :) como esta! Hermosa cartera. There is no need to stop talking about Celine bags... ever! They are all gorgeous! these bags are gorgeous! i loooove them!